Five years ago, they were both embarking on their first legislative sessions in the Texas House. 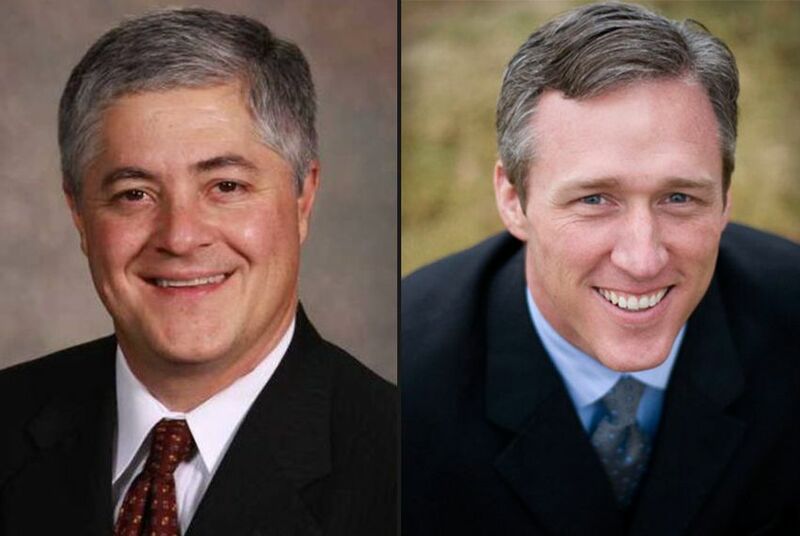 Now, Republicans John Frullo and Jim Landtroop are primary opponents. State Rep. John Frullo (left) of Lubbock faces former State Rep. Jim Landtroop (right) in the Republican primary. In 2011, Republicans John Frullo and Jim Landtroop were two new members of the Texas House going through their first legislative sessions. Frullo, of Lubbock, would go on to be re-elected two more times. Landtroop, of Plainview, saw his West Texas district eliminated through redistricting and lost a bid to serve in a new district. Now Landtroop is vying again for the House, this time hoping to unseat his former colleague, whom he argues hasn't proven to be a "true conservative." "I believe especially in West Texas, we live in one of the most conservative districts in the country," Landtroop said. "We need true conservatives in there that are not afraid to stand up for those conservative values in order to continue to make Texas great, and I want Texas to be great for my children and hopefully some day for my grandchildren." Landtroop accused Frullo of having a liberal record, pointing to a handful of votes from the last legislative session, including his vote in favor of a bill that relaxed food stamp eligibility rules for felons. Landtroop also highlighted Frullo's vote on a motion related to a proposed cut in the business franchise tax, saying it showed he voted against tax relief for small businesses. However, Frullo ultimately voted for the franchise tax cut that was signed by Gov. Greg Abbott. Frullo rejected the idea that he is not conservative enough for District 84 in Lubbock. He pointed to big accomplishments of the last session, such as providing $4 billion in tax savings and putting more money toward education and transportation without raising taxes. "You look at the particular items that we've done, you look at open carry, campus carry, we have more gun rights than we've ever had," Frullo said. "By any measure, we are extremely conservative, and more conservative now than at the end of each session than we were at the beginning of each session. I'll stand on my record of being able to deliver those results." Like in several other GOP primaries this year, the race has turned on the candidates' views of House Speaker Joe Straus, who some Republicans view as insufficiently conservative. Frullo said he supports Straus, who appointed him chair of the House Insurance Committee last session. Landtroop blames Straus for some conservative legislation that failed to pass in previous sessions. "In the house, it's all about leadership," Landtroop said. "The leadership controls the committees and the bills and the legislation that comes out of the committees, and you have good conservative legislation that comes out of the Senate, for instance, but doesn't make it to the floor of the House." He declined to specify which conservative bills died due to Straus. He also declined to say whether he would support Straus for another term as Speaker without knowing which candidates will choose to run for the position for the 2017 legislative session. Both Landtroop and Frullo have secured high-profile endorsements. Frullo's supporters include the Combined Law Enforcement Association of Texas, the Texas Alliance for Life and the political action committees for Texans for Lawsuit Reform and the National Rifle Association. Landtroop's supporters include Young Conservatives of Texas, Empower Texans and the Texas Right to Life PAC. On the fundraising front, Frullo's $256,584 in cash on hand as of Jan. 21 eclipses Landtroop's $59,616. Lubbock County Republican Party chairman Carl Tepper said the District 84 race, along with the nine-way Republican primary to replace retiring U.S. Rep. Randy Neugebauer, has rejuvenated the local GOP. He said the difference can be seen in the large groups of people block walking and phone banking in the two races. "These were tasks and talents that we had had and were starting to lose because there really are no races to fight out here," he said. "There are no Democrats filed for any of these races, so everything has become an interparty struggle, and frankly, it can get out of hand. It could be hurtful for the party, but this particular season, it seems to be making the party stronger."